Early on Easter Sunday morning many of us gathered outside St.Mary’s for the sunrise service. It was a joyful and celebratory service, ‘Allelujah!’ we proclaimed to each other and to all the wild beings that had paused to watch these strange humans, unusually awake before the sun. As we stood by the ancient carved porch, luminous in its worn silver hue, the candle flickering in and then succumbing to the breeze, I was struck once more by the fellowship that has taken place in our Church and village for so many hundreds of years. Standing in the Churchyard it's possible to see all the many ancestors who built, loved and kept this place sacred over countless generations. And then the loud ‘tchackkertchack’ of the Jackdaws who are busily weaving cradles in the tower, reminds me that they too can lay claim to this place. I wonder if the two standing on the weathervane are the descendants of the first two Jackdaws, who lived in the newly raised tower over half a millennium ago, finding shelter and a home for their offspring amongst the roughly hewn great oak beams. Jackdaws (Corvus Monedula) are social creatures coming together if they feel endangered, to fly in great groups or just to play. 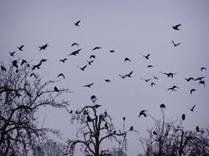 The sight of a ‘clattering’ of Jackdaws, acrobatically swooping high above is taken for granted but is wonderful to witness. Although they find a partner at the end of their first year, they don’t mate till the second, preferring an engagement period, but once together it’s for life. The large nests they build are often decorated with shiny objects which they love to collect and as many as twenty pairs will nest together in a colony. As testimony of their advanced intelligence, a study by Oxford University found that they are the only known animal apart from humans to understand the role of eyes in seeing and perceiving things. Hand reared Jackdaws were found to understand the human gaze and therefore to tell what a person is looking at. In this they are cleverer even than chimpanzees and dogs. ‘They are sensitive to human eyes because they are sensitive to their own species eyes’ the study concluded. It’s easy to believe this when you have the privilege of getting close; I climbed the tower steps to get a closer look at their nesting site only to come face to face with one in the light of my phone torch, the dark eye is full of intelligence and I quickly got the gist that I was an unwanted trespasser in their nursery. This particular bird was canonised after his death, recognised for his meticulous work of reminding the monks to pray and was renamed Saint Jem Crow. Jackdaws are known in folklore as ‘the symbol of tomorrow’, they promise of a future. Jesus would certainly have seen them in his life, they live on the tall buildings and walls of Jerusalem and other towns and cities in the Middle East. Maybe a family of Jackdaws heard Jesus preaching in the temple…. Another wild being that has caught my eye this month is the Lesser Celandine, Ranunculus ficaria. Its simple blooms decorate the verge under the hedge by the lychgate, a golden welcome onto hallowed ground. The star shaped glossy flowers and heart shaped leaves create a carpet in any wet and shady area. Owing much to the Doctrine of Signatures, its bulbous tubers gave it one of its common names, Pilewort and it was known as a beneficial treatment for haemorrhoids. Other colloquial names are Golden Guineas, Butter and Cheese, Frogsfoot and Brighteye. 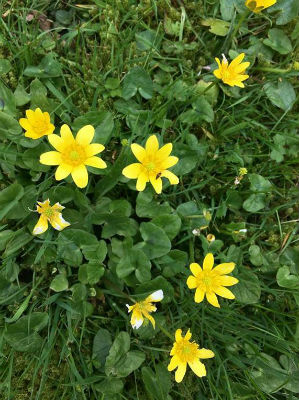 Lesser celandine is much maligned by gardeners, but it is one of the first flowers of Spring, loved by just awakened bees and is known in the language of flowers as ‘joys to come’ which fits nicely with the Jackdaws' promise of tomorrow’ at this time of year. Churches and their surroundings have always drawn edge dwellers, whether people, plants or animals. And it seems fitting, Christ spent much of his precious time with the outcasts, those deemed unworthy or without value. 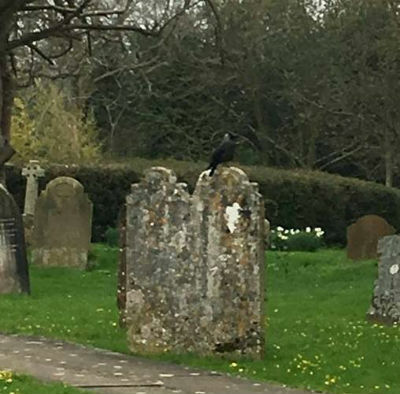 As nature is pushed to the brink and man makes his mark on the creator’s world, the three Churchyards in our benefice become increasingly important as refuge for the wild ones. It’s a blessing to be able to see, enjoy and learn from them. I hope to share my passion for the natural world, folklore, medicine, poetry and art with you over the coming months.